. . .Squire Gordon came to look at me. He examined my eyes, my mouth, and my legs; he felt them all down, and then I had to walk and trot and gallop before him; he seemed to like me, and said, "When he has been well broken in he will do very well." My master said he would break me in himself, and he lost no time about it, for the next day he began. "My doctrine is this, that if we see cruelty or wrong that we have the power to stop, and do nothing, we make ourselves sharers in the guilt. This was one of my very first 'horse' books. I read it when I was nine or ten, and it left a deep impression on me. This is the first book I ever read. I remember the day that I brought it in to show to my teacher, Miss Gerardi. She asked me if I could read it, so I started reading it aloud to her right away. 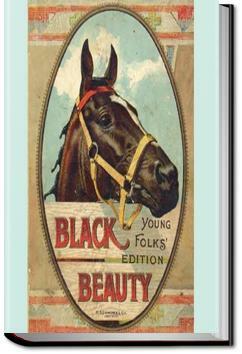 Black Beauty by Anna Sewell is a beautiful story meant for older children or very young adults. It was written in the 19th century by a woman who passed away shortly after its publication. I enjoyed the story and have given it a 3 of 5 stars, which is still very good in my book. Okay it had started as a review but it ended up becoming something totally different. It is rather dark, you have been warned.